Primarily intended for electric guitaritsts, the Tonebone Series Texas-Pro from Radial Engineering is a versatile distortion pedal with a separate, Class-A clean boost section and a built-in effects loop. The clean boost section provides up to 22 dB of gain and is accessible from its own dedicated footswitch. This circuit also engages the onboard effects loop, which allows you to loop external pedals into the boost. If you want your elevated clean tone to have delay on it, simply route your favorite echo pedal through the Texas-Pro's send and return jacks, leave the pedal engaged, and you're good to go. The distortion section comprises its own circuit activated with its own footswitch and supplied with its own controls. For instance, you can change the overall tone of the signal with a single knob, while a three-position toggle switch gives you three different characters of overdrive. Vintage gives you a bluesy style similar to the Ibanez TS9, while the Modern position sounds more like a Fulltone OCD. Maximum mode is useful for searing, high-gain aggression. The overdrive circuit feeds the boost so you can increase level for solos and lead breaks. With a 14-gauge steel construction and powder-coated finish, the pedal is rugged enough to withstand the rigors of the road lifestyle. 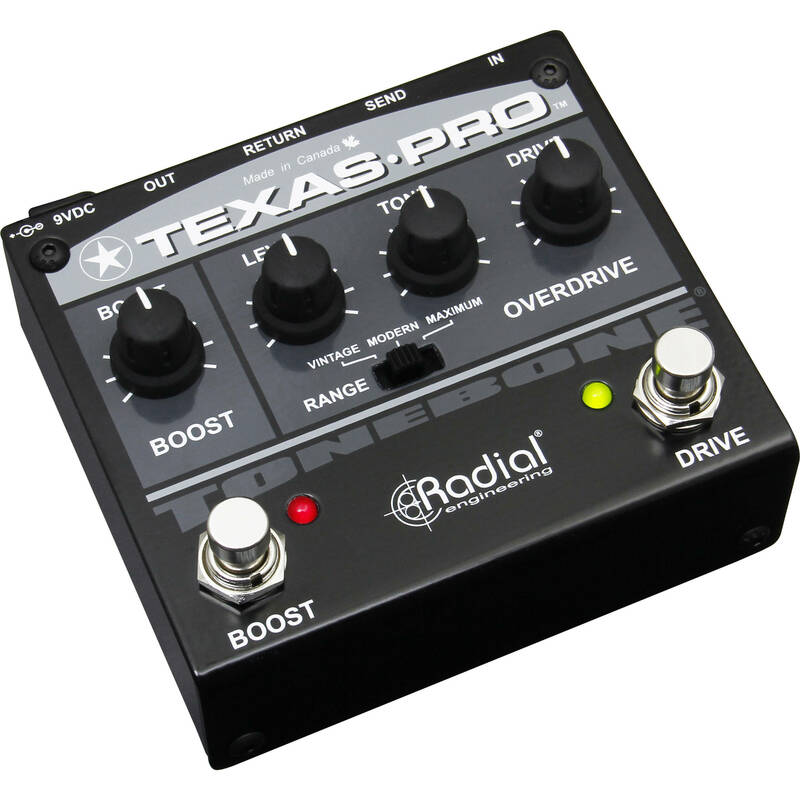 You can power the Texas-Pro from any compatible pedalboard or by using a power supply (available separately).